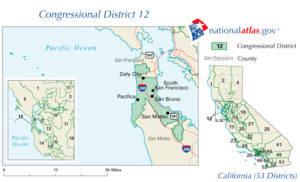 California's 12th congressional district special election, 2008 occurred on April 8, 2008. California's 12th congressional district was vacated following the death of Democrat Tom Lantos on February 11, 2008. The special election was called by Governor Arnold Schwarzenegger to fill the vacancy for the remainder of Lantos's term ending on January 3, 2009. The special election took the form of an open primary. Another election would have taken place on June 3 had no candidate received a majority. Democrat Jackie Speier won a majority of the votes in the open primary and therefore won the election. 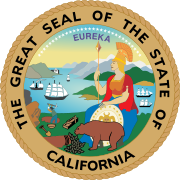 The following individuals appeared in the certified list of candidates and the certified list of write-in candidates published by the California Secretary of State, and were thus eligible to receive votes in the special primary election. Greg Conlon, a businessman and former member of the California Public Utilities Commission, who favored deregulation. ^ Kucinich, Jackie (2008-02-11). "Lantos dies of cancer". The Hill. Retrieved 2008-02-26. ^ "Governor Schwarzenegger Orders Proclamation for Special Election to Fill Vacancy in 12th Congressional District". California Secretary of State. 2008-02-12. Retrieved 2008-03-21. ^ "Election Information for San Mateo County: Special Congressional Open Primary Election". San Mateo County Elections Office. Archived from the original on 2008-04-06. Retrieved 2008-03-21. ^ "Certified List of Candidates for the Special Primary Election, Twelfth Congressional District, April 8, 2008" (PDF). California Secretary of State. 2008-03-03. Archived from the original (PDF) on 2008-06-11. Retrieved 2008-06-09. ^ "Certified List of Write-In Candidates for the Special Primary Election, Twelfth Congressional District, April 8, 2008" (PDF). California Secretary of State. 2008-03-25. Archived from the original (PDF) on 2008-06-11. Retrieved 2008-06-09. ^ Wildermuth, John; Carolyn Lochhead (2008-02-12). "Speier looks to be shoo-in to replace Lantos". San Francisco Chronicle. Retrieved 2008-02-26. ^ "Special Election Results" (PDF). Secretary of State of California. 2008-04-22. Archived from the original (PDF) on 2008-04-23. Retrieved 2008-04-24. This page was last edited on 30 December 2018, at 02:32 (UTC).